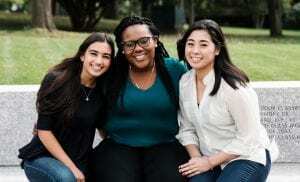 The leaders of three student organizations, from left, Simran Madhani ’18, Phionna-Cayola Claude ’18, and Marcie Mai ’18. For the first time in Providence College’s 100-year history, the leaders of three top student organizations — Student Congress, Friars Club, and the Board of Multicultural Student Affairs — are women of color. Phionna-Cayola Claude ’18 (Dedham, Mass. ), executive president of Student Congress, is Haitian-American and Catholic. 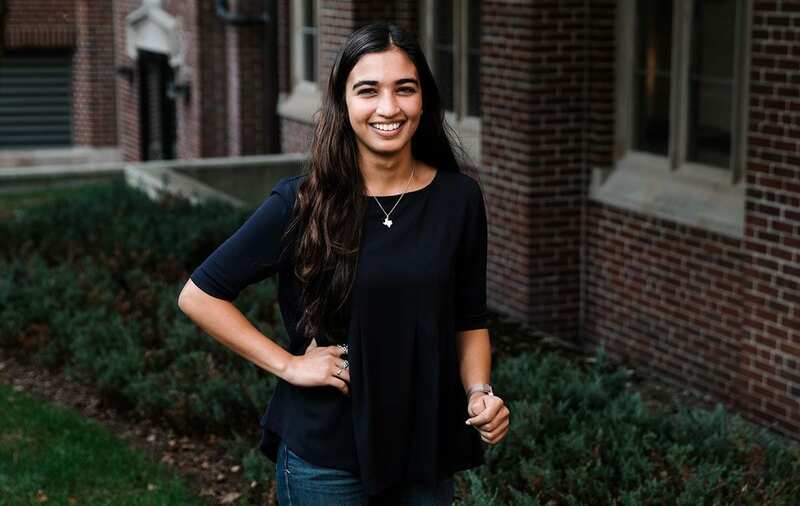 Simran Madhani ’18 (Southlake, Texas), president of Friars Club, is Pakistani-American and Muslim. Marcie Mai ’18 (Methuen, Mass. ), president of BMSA, is Vietnamese-American and Buddhist. Phionna-Cayola Claude ’17, executive president of Student Congress. Leadership is not new to Claude, who’s been class president since seventh grade. She didn’t plan to become involved in student government at PC, but she happened to walk through Slavin Center when elections were taking place her first year and decided to run for president. She was elected president again as a sophomore and vice president of Student Congress as a junior. 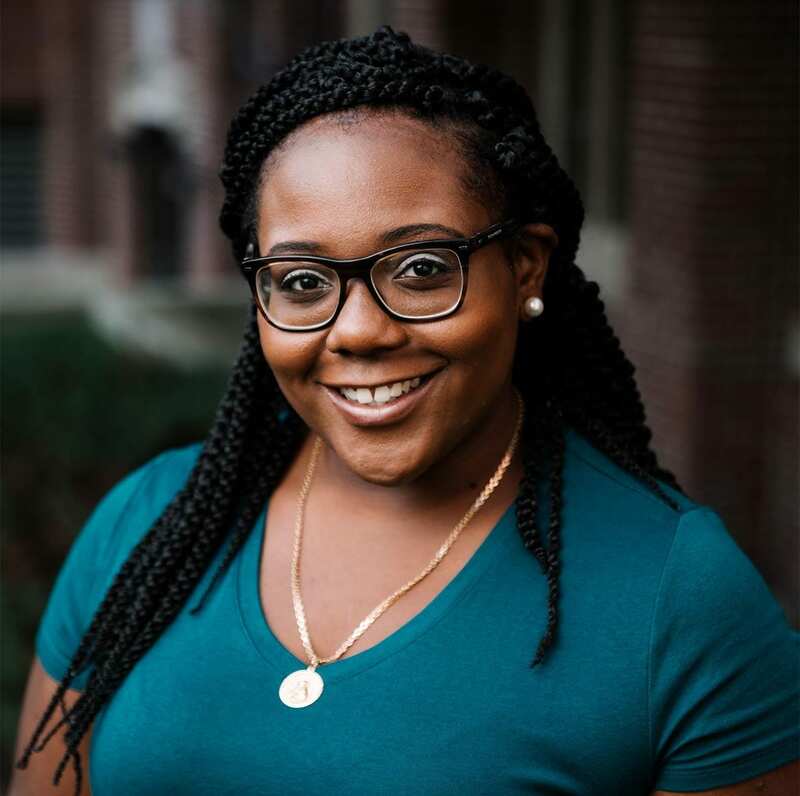 As executive president of Student Congress, Claude is part of a four-member executive board — all-female this year — that oversees the officers of all four classes and six committees responsible for matters such as academics, student life, and outreach. She meets every month with College President Rev. Brian J. Shanley, O.P. ’80, and weekly with Dr. Quincy Bevely, assistant dean of students and director of multicultural education; Tiffaney Gaffney ’03, assistant dean of students; and Dr. Steven Sears, associate vice president for student affairs. She has also met with the Board of Trustees. Student Congress is in its 68th year, but this marks the first time that its executive president, whether male or female, has been a student of color. Every year, the priorities of Student Congress change. Claude hopes to create a “greater sense of unity and support” for all 4,000 undergraduates. Claude, a psychology major and French minor, is fluent in Haitian-Creole. Her parents are natives of Haiti. Her brother, Ronald, a Boston College graduate, convinced her to apply to PC, which he had visited during his own college search. She arrived early her first year to participate in FaithWorks, a Campus Ministry program that introduces students to service opportunities in the Diocese of Providence. Claude is employed by the Office of Residence Life as head resident director for the Davis and Bedford residence halls, supervising a staff of seven resident assistants. One of her passions is spoken word, a style of poetry that mimics rap in its rhythmic delivery. She writes verse to relieve stress, and during her first year at PC, founded Believers of Words, a Spoken Word club that performs at campus events. and instead recognize my humanity. of my ancestors who never had the chance to hold the key. Simran Madhani ’17, president of Friars Club. Madhani is president of Friars Club, the College’s premier service organization and one of its oldest clubs, dating to 1928. She is the first president of color in club history. Friars Club elected its first female president in 1988, more than 15 years after PC became co-educational. The last female president was elected in 2008. “I think being a woman president of Friars Club, as well as a Muslim president of a Christian service organization, has given me the platform to show the accepting nature of students in the club,” Madhani said. “It’s definitely significant in terms of where the school started. One hundred years later, there are four women heads of campus clubs,” including Elizabeth Jancsy ’18 (Marblehead, Mass. ), president of the Board of Programmers. Friars Club members, in their white blazers, give tours to prospective students and serve as guides at commencement, convocation, Alumni & Family Weekend, and Smith Center for the Arts performances, among other events. As a high-profile organization, the club has worked to have its membership reflect the growing diversity of the student body. Madhani applied to join Friars Club in the middle of her first year at PC and was one of 14 chosen out of 150 applicants from the Class of 2018. She wanted to share her love of the College with others, especially high school students on tours. She especially enjoys giving tours to alumni: “Just hearing their stories, and seeing their eyes light up at the Ryan Center for Business Studies, or the Ruane Center for the Humanities, or the new look of Huxley Avenue,” she said. Madhani is a health policy and management major with minors in public and community service studies and business studies. She has interned with the Senate Policy Office in the Rhode Island State House, writing and researching for the Committee on Health and Human Services. During junior year, she studied abroad in London and in Kingston, Jamaica, comparing health care systems with that of the United States. She also is a student worker in PC’s Office of Institutional Advancement. Her parents, natives of Pakistan, moved to Dallas as young adults. Her sister studies at Barnard College, and her brother is in seventh grade. Madhani wants to increase Friars Club’s focus on service. At the start of the academic year, club members explored the Smith Hill neighborhood to learn more about their place in the community. They also served at the Fantasy Ball benefit for The Tomorrow Fund at Hasbro Children’s Hospital in Providence. At PC, “I’ve been given the platform to be Muslim on a predominantly Catholic campus, and to be comfortable, welcomed with open arms,” said Madhani. Update: Simran Madhani ’18 will work as a health economics and public policy associate for Musculoskeletal Clinical Regulatory Advisers, an advisory firm to the musculoskeletal industry, in Washington, D.C.
Marcie Mai ’17, president of the Board of Multicultural Student Affairs. Mai’s year as president of the Board of Multicultural Student Affairs opened with a Solidarity Walk on the Slavin Center lawn in response to violence during the summer in Charlottesville, Va., and in Barcelona, Spain. “BMSA is filled with a lot of students who are passionate about social justice issues and the intersectionalities that go along with that,” said Mai. BMSA is an umbrella organization that oversees 15 cultural clubs on campus and sponsors some of the most well-attended student events. 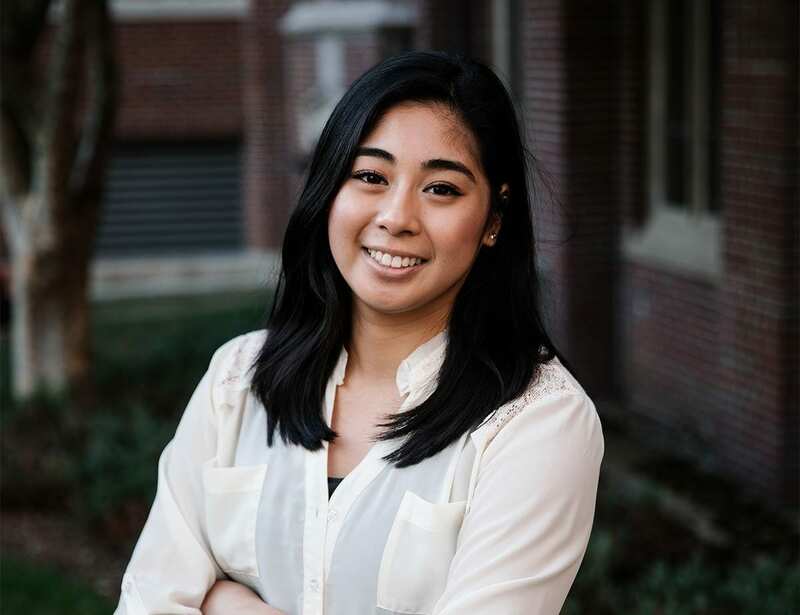 Mai applied for membership at the end of her first year, served on the Events Committee as a sophomore, was vice president of the executive board as a junior, and then ran successfully for president. She grew up in a close-knit family in Methuen, Mass. Her parents immigrated from Vietnam and spoke Vietnamese at home. Her older sister studied allied health services at the University of Connecticut and now works as a surgical neurophysiologist. Her younger sister is a student at Ithaca College and wants to be a physical therapist. The sisters always have been each other’s role models. She entered PC as a biology major, planning a career in medicine like her sisters, but discovered that hands-on health care was not her forte. Instead, she decided to study health care through a sociology lens. She majors in both health policy and management and sociology. During the summer of 2017, Mai traveled to Cape Town, South Africa, to participate in a global service-learning course, Social Infrastructures in South Africa. She spent two weeks with PC students and students from the University of Cape Town, studying and observing community engagement. The experience changed her perspective. Like Claude, Mai arrived on campus early as a first-year student to participate in FaithWorks. She has served in New Orleans during winter break, traveled to Tijuana, Mexico, with a class studying Global Border Crossings, and will spend spring break in Nicaragua as part of another global service-learning class, Foreign Aid. She worked as a resident assistant in McVinney Hall and was an admission ambassador. Update: Marcie Mai ’18 will pursue dual master of arts degree programs. She will study for a master’s degree in conflict resolution and coexistence from the Heller School at Brandeis University and for a master’s degree in international law and human rights from University for Peace, Costa Rica.